BMW Luxury Touring Community > BMW Bikes > RT Series > Iliumworks or Wunderlich R1200RTW crash bars? 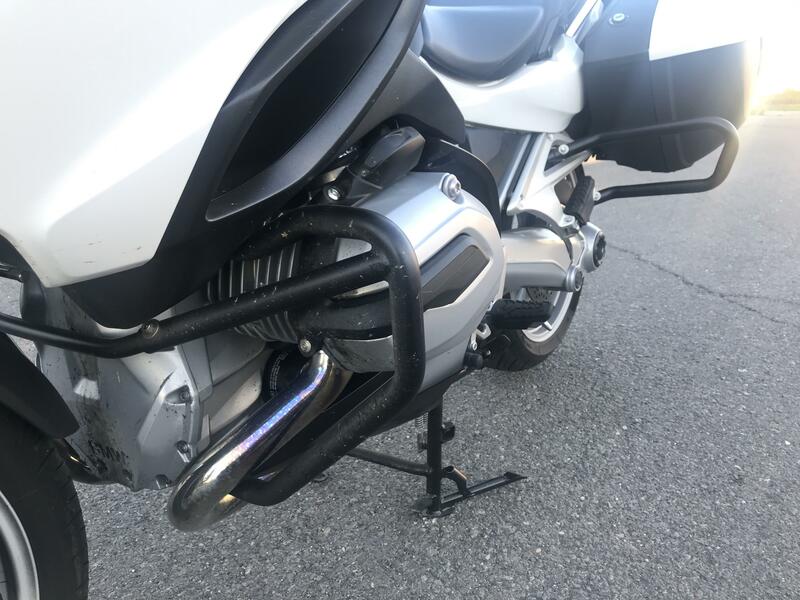 Re: Iliumworks or Wunderlich R1200RTW crash bars? At the time of purchase the dealer was offering a great deal on the Wunderlich bars, so I went with them. I like the way they look and I've had good luck with Wunderlich products in the past. On long trips, I sometimes use them to stretch/rest my legs for short periods of time (sans pegs) and they're surprisingly comfortable for this. Frankly, I hope I remain unable to comment on the effectiveness of their intended purpose. I have the Wunderlich crash bars front and rear. my wife , who rides with me all the time does NOT like the rear bars ; as they pressure the back of her leg and push her foot forward on the pegs. Shortly before replacing my K1300GT with an '18 RT, it got away from me while walking it through the garage. A plastic trash can took most of the hit, but it did prompt me to install Ilium bars front and rear on the new bike. The black color hides them nicely on the white RT. The installation was straightforward even for a ham-fisted garage tech. The rider trailing me on our breakfast ride this morning mentioned that the rear bars were close to grounding in the tighter corners. Sure enough, both rear bars showed grind marks on the lower outer edges. Something I'll keep in mind on future rides. I've been riding with the suspension in the SOFT setting, with rider and bags. I'll play with the settings a bit and see if I can get more ground clearance. I have the Iliumworks, just one comment regarding choosing the silver vs black, I bought the silver and after 1 year and 16k miles the silver ones had rock chip marks that discolored and were quite visible. I spoke with them as I thought 1 year of usage and the amount rock chips might have indicated a bad batch of coating or somesuch. They sent me new replacements and I asked for the black instead. I have just shy of 36k on the bike now and 2 yrs on the black bars, they have chips as well but do not show up near as much on the darker bars as opposed to what the silver ones did. Just something to consider. + 1 for Ilium Works !! !